AFTER THE SUCCESSES OF 1 AND 2 WAR DUBZ CONTINUES TO BRING US THE QUALITY WE’VE COME TO EXPECT. 2ND TO NONE AND EK9 WILL DAMAGE YOUR INNER EARS WITH THESE TWO SONIC ASSAULTS ON THE SENSES! 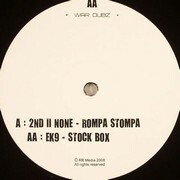 2nd II None - "Rompa Stompa"